A game-changing story about stocks just broke—and you almost certainly missed it. That’s why I’m writing about this surprising news today: because it’s just what you need to know if you’re struggling with how to approach this interest rate–obsessed market, especially in the wake of the recent pullback. Why haven’t you heard it? Because good news like this doesn’t grab as much attention as Chicken Little panic articles, so the financial press skips it. But what I’m about to tell you is crucial to your financial well-being—and something I’ve been saying on Contrarian Outlook and in our CEF Insider service for months now. Luckily, not everyone is ignoring the story. Bloomberg Businessweek just wrote an in-depth analysis of this piece of news, which is simply this: fears of a recession are way overblown, and the market is set for strong gains in the months ahead. I was glad to read this upbeat news, because it echoes a piece I wrote over a year ago. The theme of that article was simple: there are several clear recession indicators and none of them have been in the danger zone for a while. Fast-forward to today and they still aren’t—and aren’t likely to be for a long time. Also note that chances of a recession happening in the next two to three years have also plummeted, bringing all readings except for the 12- to 24-month one to at or near their lowest levels in the last couple years. Taking this at face value, it seems the chances of a recession happening soon are diminishing. But let’s dig a little deeper. What exactly is the data being charted by these lines? 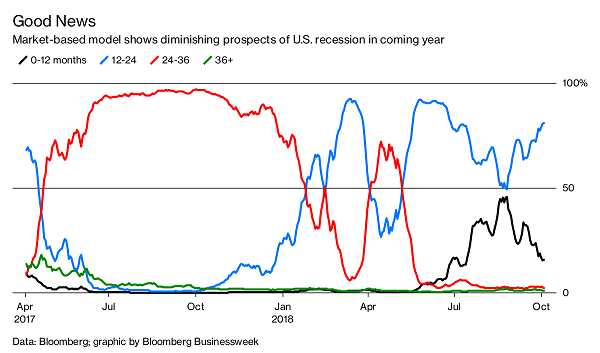 Bloomberg’s recession predictor blends a lot of information, but the factor that has caused the red and black lines above to fall steeply is US Treasuries. 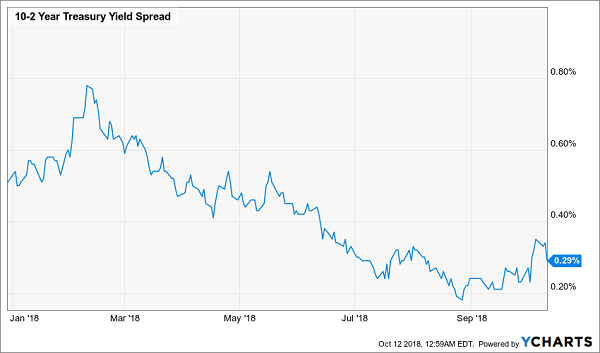 A couple weeks ago, I took a close look at the “yield-curve panic” that has been facing markets in 2018. If you were paying attention in February and March, when the markets sold off, you’ll remember that the bears couldn’t stop talking about the flattening yield curve—specifically, the difference between 2-year and 10-year Treasury yields. Notice how this isn’t the first time that downward trend suddenly saw a reversal. The same thing happened in February. To call this the start of a bear market is just silly. What we are seeing over the longer term is a new trend: higher stock prices happening alongside a steeper yield curve. This is a really good pattern to see. Steep yield curves indicate higher expectations for inflation and, more crucially, economic growth. Just as negative yield curves are the market saying a recession is going to come, a positive yield curve is the market saying growth is going to get faster. And what benefits when the economy is growing faster? Stocks. An index fund like the S&P 500 SPDR ETF (SPY) would get you exposure to the stocks that will win in such a market, but you can compound your gains and get a higher total return by buying an equity fund that’s trading at a large discount to its portfolio value, or NAV. While ETFs almost never trade below their NAVs, closed-end funds (CEFs) do—and that unusual inefficiency in CEFs is an opportunity for contrarian investors to get high-quality stocks at a discount. For example, the Dividend and Income Fund (DNI) has a 7.2% dividend yield while also holding high-quality stocks like Apple (AAPL), CVS Health (CVS) and AutoZone (AZO), but it trades at an almost unthinkable 24.8% discount to NAV, meaning $1 of those shares is up for sale with DNI for just 75.2 cents. Most Wall Street spreadsheet jockeys say we investors can’t have both the income and safety of bonds and the upside of stocks. We have to choose, or allocate, or whatever. They’re wrong. My 8% “no withdrawal” retirement strategy lets retirees rely entirely on dividend income and leave their principal 100% intact. Well, that’s not exactly right. Their principal is more than 100% intact thanks to price gains like these! Which means principal is actually 110% intact after year 1, and so on. If you’re an investor who strives to live off dividends alone, while slowly but safely increasing the value of your nest egg, these are the ideal holdings for you. Click here and I’ll explain more about my no withdrawal approach – plus I’ll share the names, tickers and buy prices of my three favorite closed-end funds for 8.5%, 8.7% and 8.9% yields.